Another contemporary take on midcentury style, the bright colour and the flexibility of Barker & Stonehouse's Lulu chair make this one an appealing option. The chair is loosely inspired by mid-century designs with a low wide seat complemented by a shallow buttoned back. It's available in two eye-catching colour options – the 'zest' pictured, or an unusual silver. What makes this design a bit more unusual is that it can easily be converted into a chaise longue. Simply combine with the matching footstool and the compact sofa seat cushion, as shown below, for extra lounging appeal. Lulu is priced at £629. 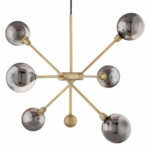 See it on the Barker & Stonehouse website.